We are currently looking for PhD students through The International Graduate Program (A). If interested, please send your CV and a motivation letter to Dr. Takashi SUZUKI. Please note that this program combines Master and Doctor course in one. The establishment of well-defined synaptic connections between neurons is critical for information-processing in the brain. Synapses are often concentrated in small areas which are organized in columnar and layered structures. These particular structures reflect a precise organization of synaptic connections. In the visual system for instance, nearby photoreceptors in the input field connect to nearby columns in the target field. This ordered projection of neurons, called topographic map, preserves the spatial relationships between the visual word and its representation in the brain. In addition, photoreceptor neurons which respond to different features of a visual stimulus, like color or brightness, form synapses in distinct layers in the brain (Fig.1). 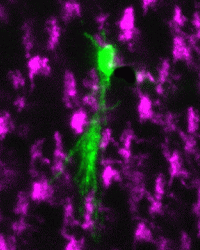 How is this precise pattern of synaptic connections achieved during development? The growth cone, a highly sensitive and motile structure at the tip of extending axons, can detect and integrate multiple specific guidance cues along its way and translate them into motility (Fig.2). 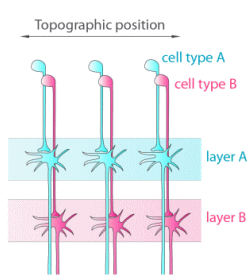 Long-range axon guidance cues and topographic mapping first bring axons in close proximity to their target region, reducing the astronomical numbers of their potential synaptic partners. Then, short-range guidance cues and cell surface recognition molecules allow axons to select their appropriate synaptic target. To dissect the molecular mechanisms involved in synaptic targeting specificity, our lab use the Drosophila visual system. The Drosophila eye is composed of about 750 units called ommatidia. Each ommatidium contains 8 different types of photoreceptors (R1-R8). R1-R6 are responsible for motion detection, and their axons connect to the first optic ganglion, the lamina. R7 and R8 can detect colors, each responding to different wavelengths, and form connections in two distinct layers in the medulla (M6 and M3, respectively) (Fig.3). Using histochemistry, molecular genetics, as well as cell culture-based assays and biochemistry, we are trying to decipher how this specific pattern of connections is formed during development. environment to find its way. Fig. 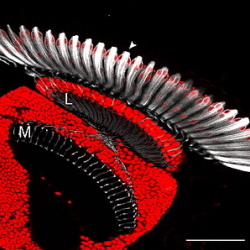 3 The Drosophila visual system. copyright(c) 2012 Tokyo Institute of Technology all rights reserved.